Last updated: Feb 8, 2019. 15:33 UTC. The cPanel Autoresponder feature allows you to automatically send response messages if you are unavailable for any reason, such as on holiday. The emails will still reach your inbox, and you can deal with them at a later date. Another reason to use an Autoresponder is if you have a “no-reply” email address. It is recommended to set up an automatic email reply to say no one has seen the email. 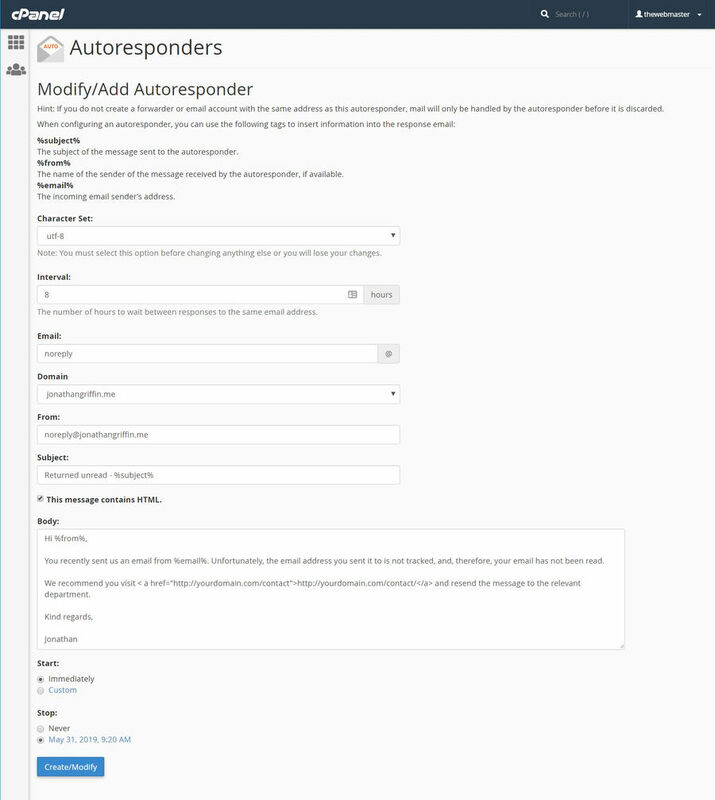 I’ll now walk you through how to create an autoresponder using the cPanel Paper Lantern theme. 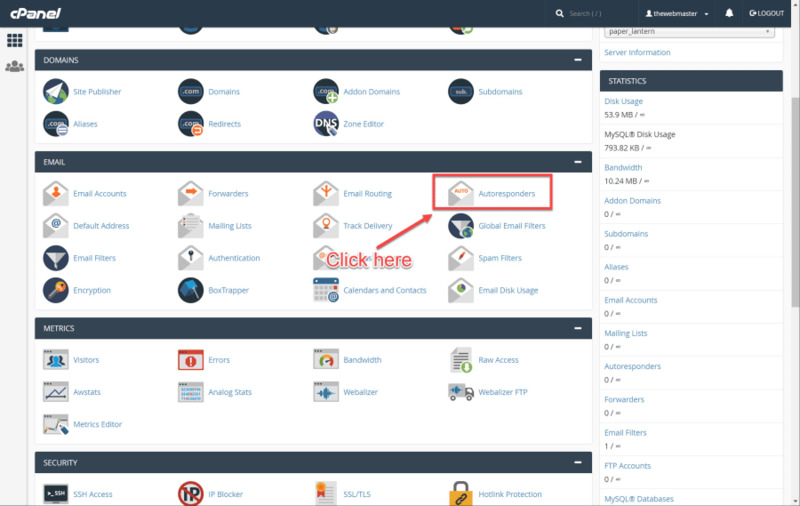 Once you are logged in to your cPanel account, scroll down to the Email section. Click on the Autoresponders icon. Click on the Autoresponders Icon in the cPanel Dashboard © The Webmaster. Click 'Add Auto responder' © The Webmaster. This stage is where you configure your autoresponder. I’ve added a full screenshot here with some sample settings. I will go through each of the settings in more detail in the following steps. Modify / Add Autoresponder © The Webmaster. Make sure you configure this setting first. If you change it later you, will lose any other changes you have made on the page. Character Set © The Webmaster. The cPanel Responder Interval governs how often you will automatically send a reply to the same person. For example, if you receive from email to joe@blogs.com, it will immediately reply. However, if joe@blogs.com sends you another email, it will not send another email until the period set by the autoresponder expires. This is useful to prevent you from spamming someone’s inbox with the same message over a short period which can look unprofessional. cPanel Autoresponder Interval © The Webmaster. This is the email account that will trigger the autoresponder. Email - This is the first part of the email without the domain name. Domain - This is the domain name part of the email. Putting these two fields together will form the complete email address. Email and Domain © The Webmaster. Enter the email address here that you wish for your reply. Enter the subject of the email that you wish to send out as your Auto Response. You may want to use the same subject used by the sender in your reply. To do this, you can use the %subject% tag. If you would like to use HTML tags (for example adding clickable links, or images), click this box. Add the content of your automatic reply. %from% — This will insert the name of the sender into the email reply if available. Otherwise, the email address the sender used will be entered. %email% — This will insert the incoming email sender’s address into the reply. You could acknowledge an email to say it is received (good for support emails) or say you are away on holiday. You could add further information such as when you expect to return. Start — Here you can choose Immediately or Custom. If you select custom a small calendar will appear allowing you to choose the start time and date for the autoresponder, for example, when you going away on holiday. Stop — Here you can choose Never or Custom. If you select custom a small calendar will appear allowing you to choose the stop time and date for the autoresponder, for example, when you return from holiday. If you have a no-reply email, you can set it to continue indefinitely. The custom time \ calendar will reformat times into 12 hour format, based on your workstation operating system time, and translates it into GMT. Start and Stop © The Webmaster. You can remove an autoresponder when you no longer need to use it. If you use a specific autoresponder often, instead of deleting it, you can change the email address to which it applies to a non-existent one. You can then reactivate it in the future by changing the email address back. 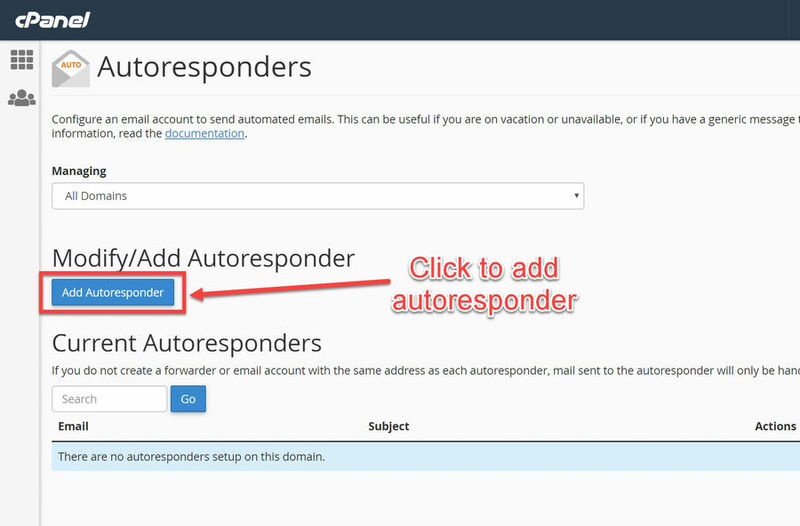 Under Current Autoresponders, click delete next to the autoresponder you wish to delete. Delete your Autoresponder © The Webmaster. Click Delete Autoresponder to confirm the deletion. Confirm Deletion © The Webmaster.